BTOB's Hyunsik presented viewers with his precious music equipment! Hyunsik, the producer of BTOB's recent all-kill track "Missing You", appeared on 'Hyena on the Keyboard' as a producer-composer. 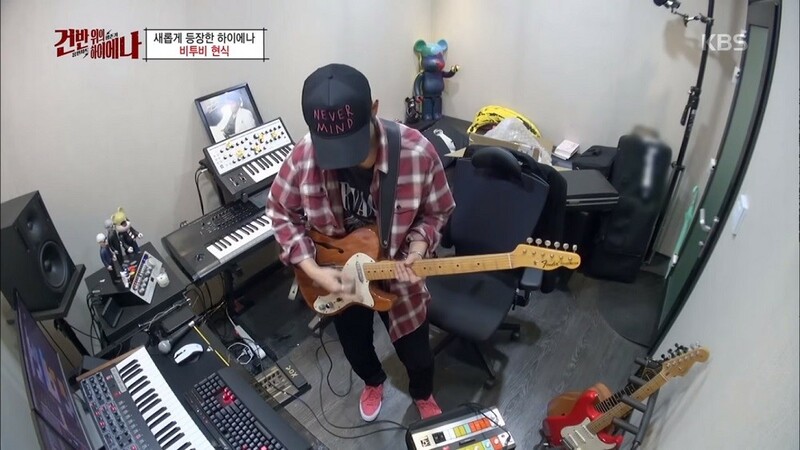 As the most recent member to join the show, Hyunsik disclosed his music studio for the first time, displaying his most valued music items. They were none other than his old electric guitars and special MIDI instruments, items that he had bought and collected on the way. One white guitar, for example, was bought in the United States. Hyunsik says, "I couldn't even use it often, since I am afraid that it will get dirty." His showed his special love and care for his instruments, seeing as the price tag was still attached on the guitar. Another one of his equipments included a very old tool, a guitar-effect MIDI made in the 1960's. "Instead of buying clothes, I decided to invest in music if I were to spend my money anyway," shared Hyunsik. Watch Hyunsik on this week's 'Hyena on the Keyboard' below!